Just today, I made myself work a lot harder than was ever necessary. It started with a little bit of overconfidence, transitioned to about thirty minutes of frustration and swearing, and ended with success and a self deprecating laugh. It started when I need to create a sample script to defragment an Autodesk Vault database. How hard can it be, after all? It's a short script. It's only a few lines long anyway! First, I grab the sample script from the Vault Help system. You can find that in the defragment section at this link. So now I have my command! This will fire up the command, but I still need to add my path information as well as my Vault name, I also need to add my administrator username and password. So a little cutting and pasting I have the script I need. Now, time for the test. I run it once, it flashes on the screen and immediately disappears. I check for syntax error, and I do find one. Which I quickly fix. But the script doesn't run. I check my vault name, my administrator name. My vault doesn't even have a password! And for those of you with your mouse key on the comment button... I know it's bad practice not to have a password for the administrator! But this is a personal Vault, on my laptop, which only I access. So Thpppt! Finally, I have an idea. One that I should have had a lot earlier than I did.. I add the word Pause at the end of my script. So the script won't disappear when it finishes. Let's take a second and think about this. As soon as I run the script. I see two words immediately. "Not Recognized". I say phrases commonly found in garages, aircraft hangars, and factories everywhere. The double quotes at the each end of the path are missing! Wait! What? This is the problem! I look at my reflection in my computer screen. "You Idiot!" 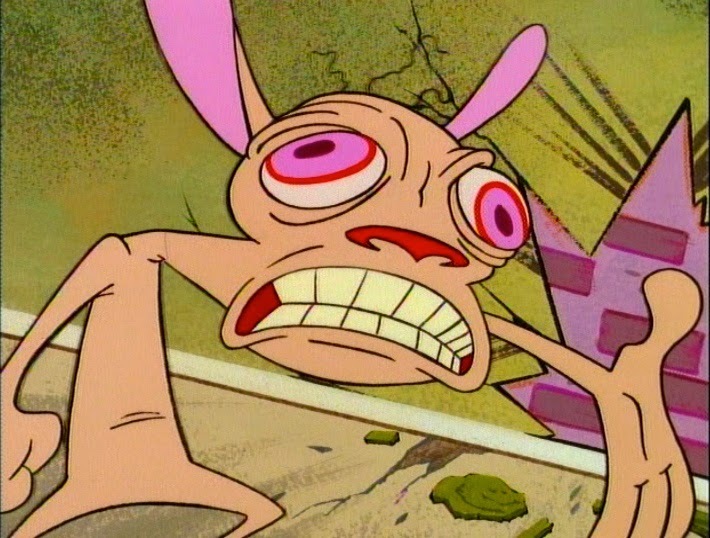 I shout, channeling my inner Ren. It felt a little like this. I should have known! When running a command with spaces in it, you have to put the command inside of quotes. If you don't , the script reaches the first space it sees, and tries to execute that. 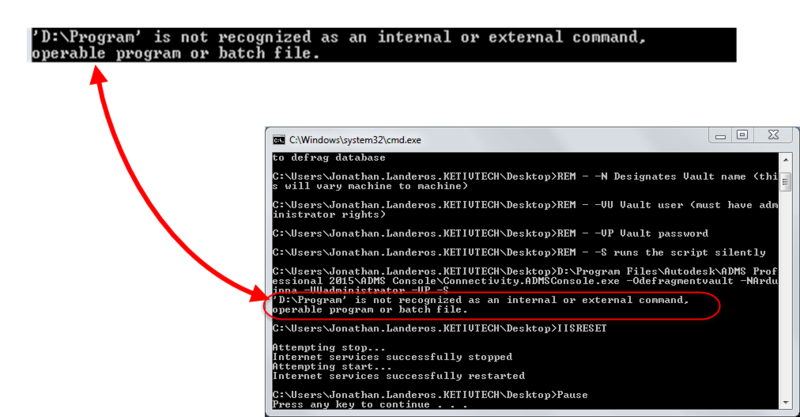 So my batch file got to D:\Programs, tried to run that, and didn't know what to do. The quotes (in red) placed before D:\Program and after ADMSConsole.exe make all the difference in the world. One more shot, and it runs fine! So the final script looks like this. And that's it! It's ready to go. Ultimately, what did I take a way from this one? Use the PAUSE command to help analyze scripts. Because it was a short script, I figured if I studied it, I could find my error. But I didn't see the missing quotes. I missed the trees because of the forest, if you will. By adding the PAUSE command, I found my error in seconds. Literally seconds! Slow down, you'll go faster. Since this was an easy script, I thought I'd "bust it out quick". Had I taken a little more time, and thought about my approach when I hit a snag, I may have solved it easier. Pay it forward. I made a mistake. One I should have been able to avoid. Here it is for you to learn from. Hopefully, you can use this to avoid the pitfalls I found! 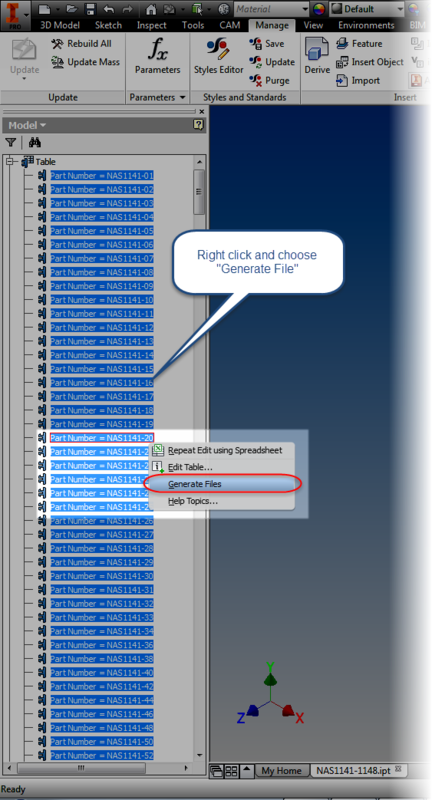 On a final note, there are several administrative commands that can be scripted using batch files in Autodesk Vault. Learn more about them by following the link to the Autodesk site here! 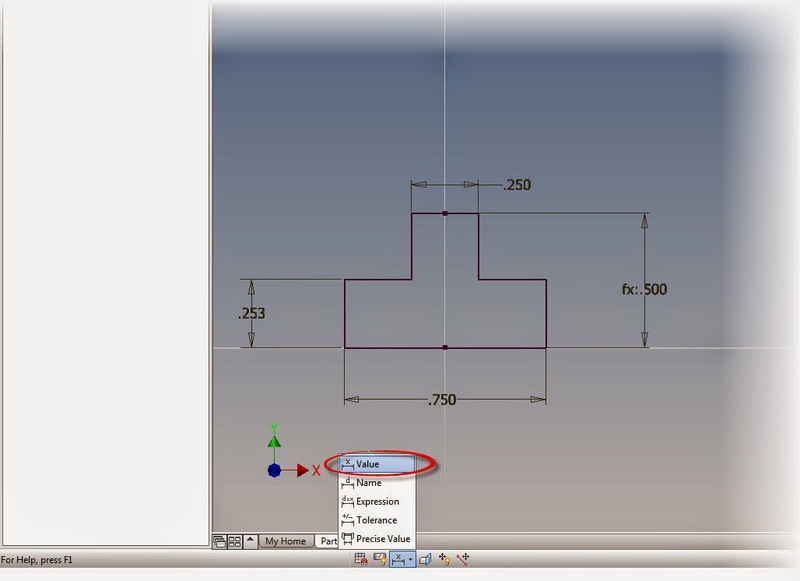 Shimming Your Knowledge- Changing Dimension Display in Autodesk Inventor. I hectic schedule has required I take a different approach to my videos. Instead of longer videos, which of course take more time to create, I'm going to create something shorter. Originally I was going to call them "Microtips", but a friend suggested "Shims" as in the shims used in manufacturing. But instead of using a these shims to adjust components for proper fir, you're shimming your knowledge for more productivity! Now, let's use a this tip as a shim to adjust your knowledge for a better fit! To start this out, here's one from the Inventor status bar, which is visible when a sketch is active, there are several buttons listed there, but for this tip, I'm just going to focus on the dimension display icon. This icon changes how dimensions are displayed on your sketch, each providing you different information. 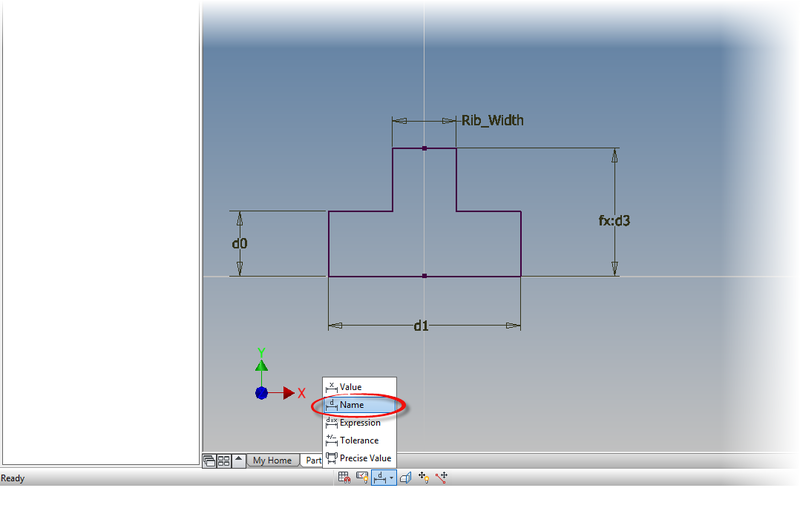 1) Value - This option is the default for Inventor. 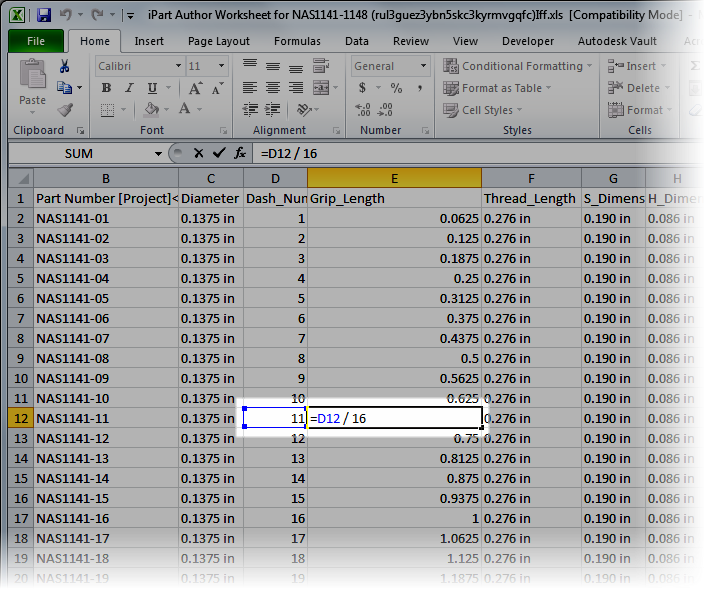 It shows the numerical value of the dimension, using the number of decimal places as set in the file's Document Settings. 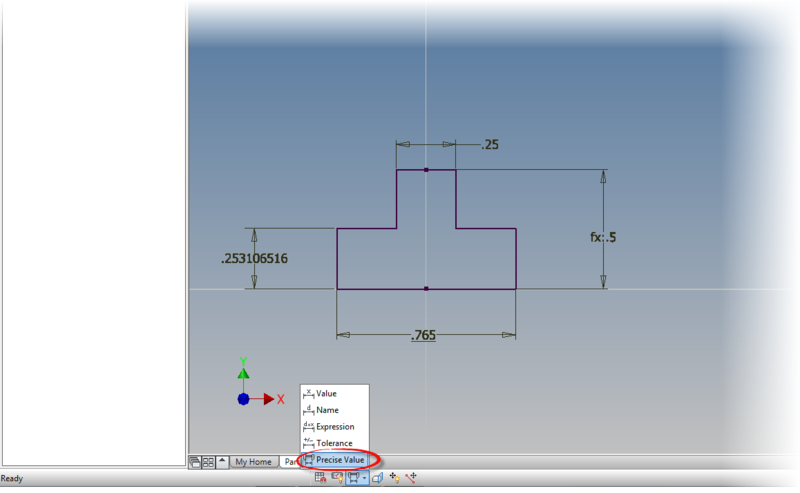 2) Name - The Name options shows the name of the name of the dimension. 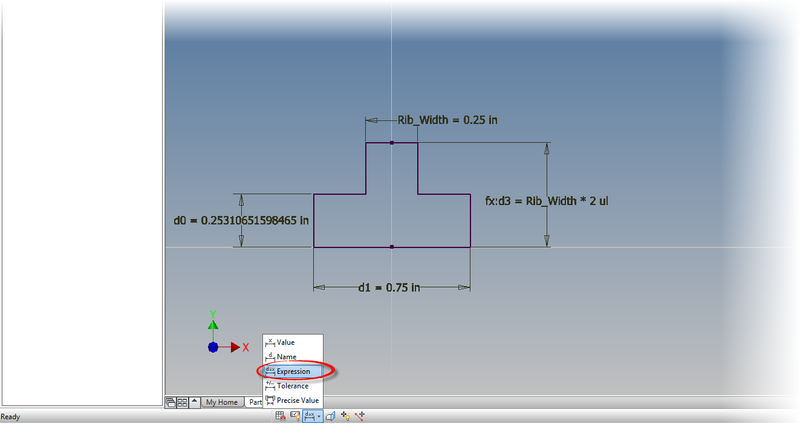 Notice that if a parameter is renamed, then that name is shown, instead of Inventor's default "dx" format. 3) Expression - This option displays both the dimension name, and the value at the same time. If dimensions are linked to create mathematical expressions, these will be shown. 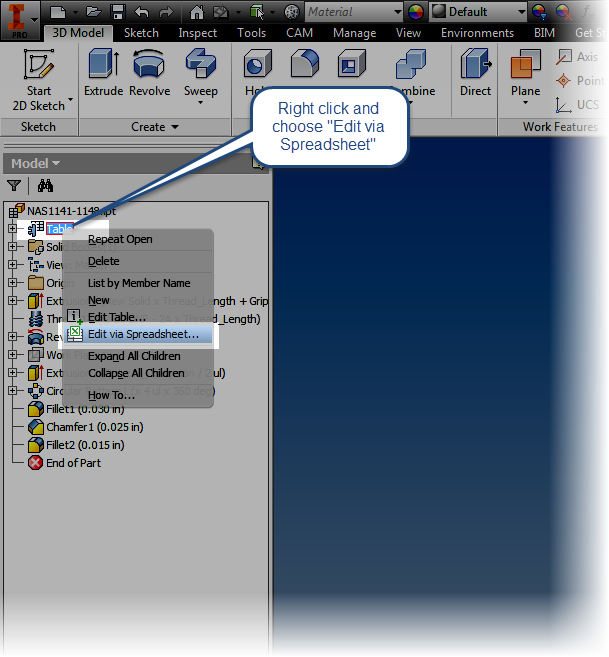 It also removes trailing zeros from a dimension, as well as showing additional decimal places for a dimension if it contains more than set in the Document Settings. 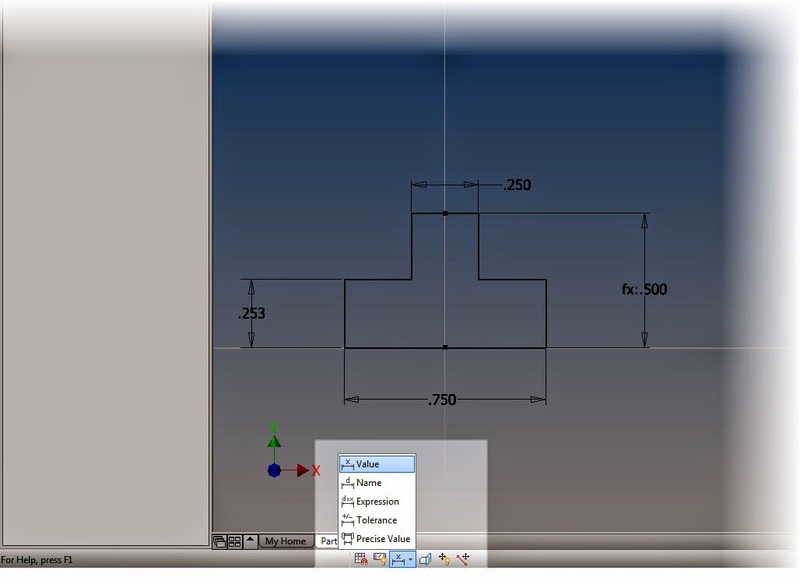 4) Tolerance- If you've applied tolerances to a dimension, this setting will display the tolerances on screen. Additionally, any time a tolerance is evaluated at a value other than nominal, it will be underlined. This is true of any dimension display setting. 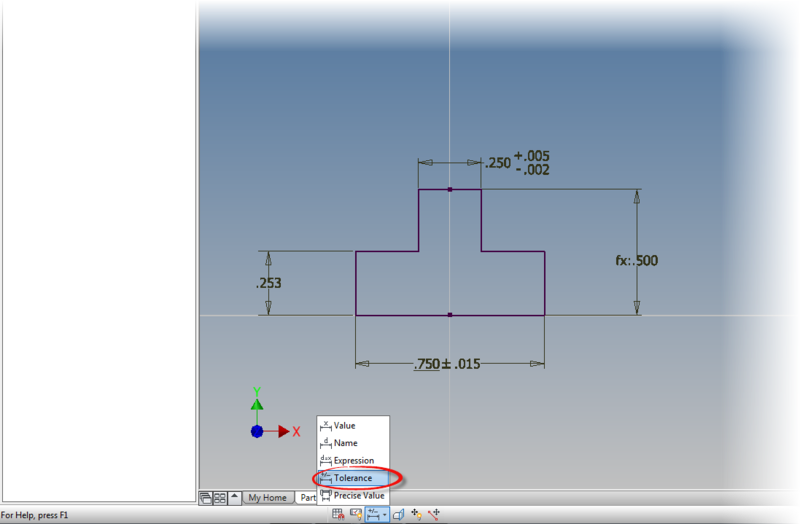 For more on using tolerances in Inventor, see my earlier post! 5) Precise Value - This option removes trailing zeros from a dimension and showing the full decimal for a dimension if it exceeds the Document Settings. It also shows the value of a toleranced dimension, even if it's being evaluated at a dimension other than nominal. And that's all for a short tip on Dimension Display! I wanted to create something short and sweet. I hope this helps! I'm thinking of continuing to do this with the "little things" that are always a little hidden in Inventor. If you think that's a good idea, throw in a comment below! And a final note! Here's a video describing the steps above! 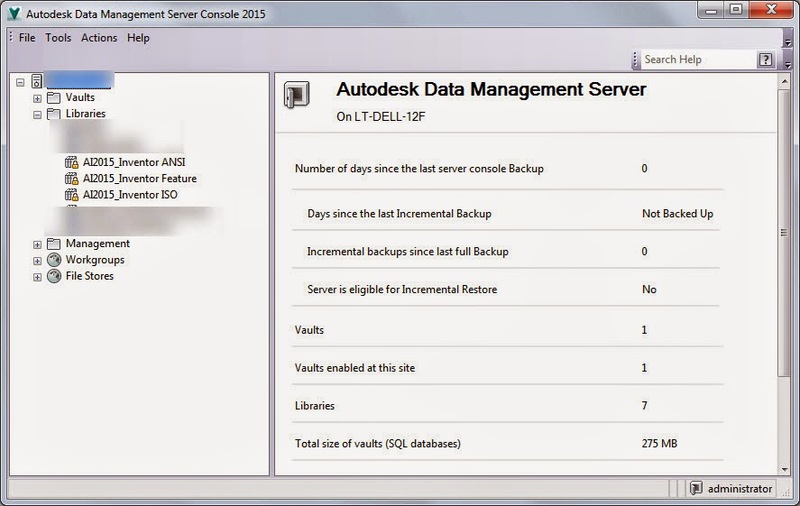 How to Attach Content Center to Vault 2015 through the ADMS Console! 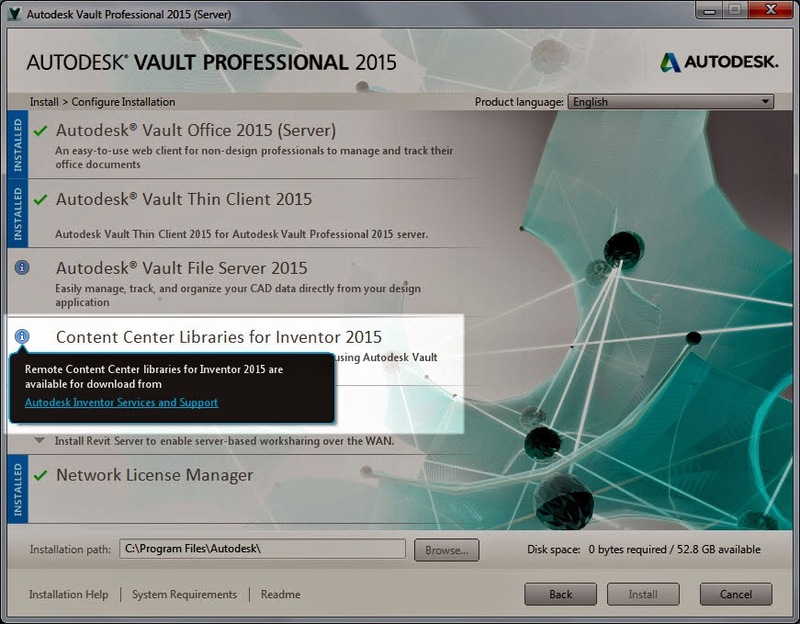 Recently, I found myself installing Content Center Libraries into Autodesk Vault 2015. It was standard operating procedure; I've done it a dozen times. One thing new to the 2015 version of Vault, is that the Content Center Libraries are downloaded from the link here, instead of being provided on the media or in explicitly in the download. The installer even states that when you're select it from the Install Tools & Utilities screen. No Content Here! But there is a link to download it. If you follow the instructions in the readme file, the steps aren't too difficult. Just download the libraries you want, extract them, click on the batch file, and wait for the libraries to install. And if that’s how you wish to install the Content Center Libraries, go right ahead. It works nicely! Compressed Content Center on the left. Extracted and ready to go on the right! But if you desire, there is an alternative way as well, if you prefer. Start out by extracting the files down to the point where you can see the libraries in question, they end in the *.mdf and *.ldf extensions. For example. AI2015_Inventor ANSI.mdf, and AI2015_Inventor ANSI_log.ldf if you’re using the ANSI standard. Take these files, and copy them into the location with the other libraries for Vault, this location can vary, as an example, the location on my own machine is. 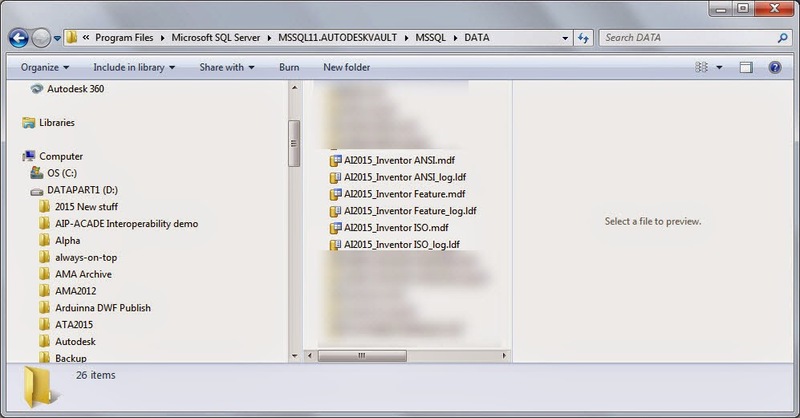 D:\Program Files\Microsoft SQL Server\MSSQL11.AUTODESKVAULT\MSSQL\DATA. In my example here, I've copied the ANSI, ISO, and Feature libraries. But you can copy as many or as few as you want. This will make the files available Vault, but Vault does need to be told to use them. 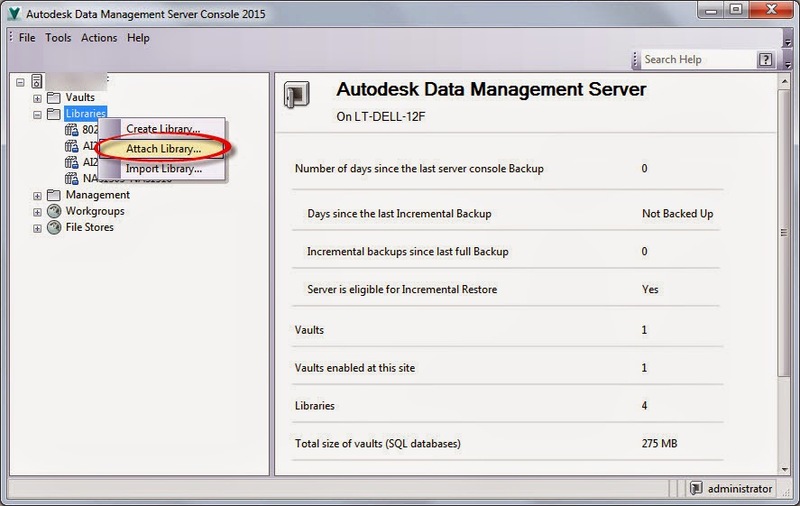 In order to tell Vault that it’s going to be using these files, open the ADMS Console, locate the Library folder. Once you have that, right click on the folder and choose Attach. Attaching the libraries you want. The libraries that have been placed directory appear, and you can add them to Vault by selcting them and clicking OK.
You'll have to choose each individually, but this only takes a few minutes for a big library, or just a few seconds for a small library. You can add as many, or as few libraries as you need. I'd suggest skipping any libraries you don't want. There it is! An alternate way of loading the Content Center Libraries into Vault. But that does beg the question "So what?". Why would you load the libraries using the alternate way, instead of the other way? The truth is, you can use whichever way you want. It matters little in the grand scheme of things. But if you've already have the extracted libraries, or you don't have the handy dandy batch file available, this can be a quick way to get where you need to be. 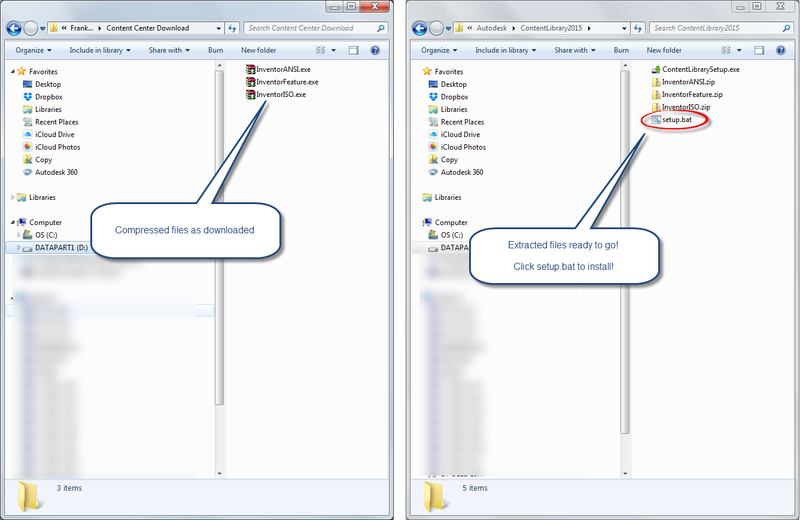 I've even seen some clever Vault Admins use the Detach option as a way of "deleting without commitment" . They detach the library and make it unavailable to Vault, so users don't have access to it. If at some point it turns out the users *do* need it, they just reattach it, without having to go through the process of downloading and extracting. So keep it in mind as just another tool you can use to make your life a little easier. . The Vault Service is Alive and Well! Why Can't I find the Data Management Services?!?! Not that long ago, I ran into a Vault issue that I can only describe as truly puzzling, and more than a bit nerve wracking. It all started out with the phrase that will strike fear into the heart of any Vault Admin. "Vault's down. Engineering is at a standstill." In Vault world, this is the same as hearing "Shields are down, weapons offline, and the dilithium crystals are nearly dead." If you haven't heard this phrase, you're lucky. If you have, trust me, it'll make you want to grab a red shirt and join the away team. Left with no choice, I plunged in. With Vault off line, many scenarios become a possibility, most of them not good. The error being displayed by every single client was. I reset IIS, the IT Admin rebooted the computer. The same error appeared. I checked the standard issue things. SQL Server? Serving SQL just fine. Firewalls? Allowing traffic to pass. Meanwhile, engineering has accepted a dare to use old office supplies, stale chocolate, and a 63 VW Beetle chassis to create an upgraded version of Rock 'em Sock 'em Robots. Finally, after a bit of searching, the solution presented itself in the form of the link on the Autodesk support site here. A document came up, the first thing it said was check for the following in the Vault logs. You'll commonly hear them called "Vlogs", and can be found using the instructions at this link. Exception(Inner): There was no endpoint listening at https://avia-srv3/AutodeskDM/Services/_impl/SiteService.svc that could accept the message. This is often caused by an incorrect address or SOAP action. See InnerException, if present, for more details. Apparently, for reasons unknown, there was an SSL error that was preventing the connection to Vault. I don't know all the ones and zeros that would cause this, and now with engineering trying to attach flamethrowers to their super-sized boxing game, we were focused on fixing the issue. 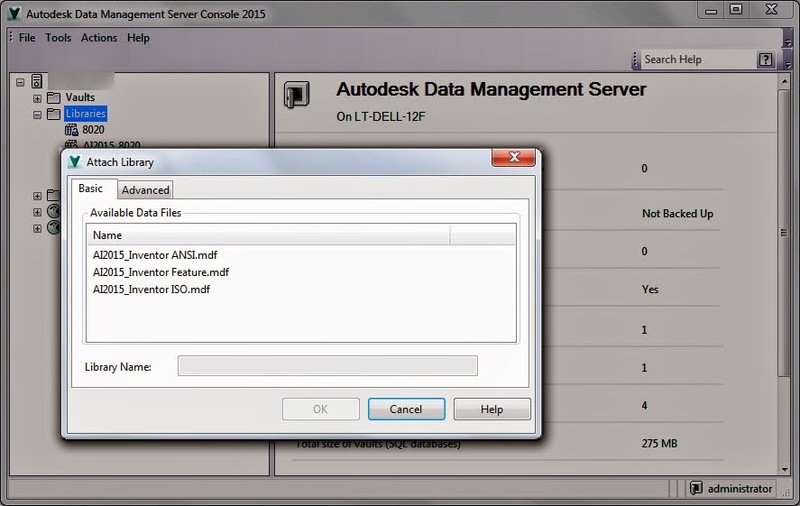 Start the Autodesk Data Management Server Console (ADMS) and go to Menu tools > Global Settings > Advanced Settings > Email. Remove the selection from the "Enable Compatibility with SSL" option. But that doesn't solve my issue. When I try to go to the Tools pulldown, I get the following error. Fortunately, the solution at the link contains instructions for that case too! Use Notepad to open the web.config file from C:\Program Files\Autodesk\ADMS Professional 2014\Server\Web\Services . Change the sslRequired key from "true" to "false." I run these solutions, and for good measure, type IISRESET at the windows command prompt to bounce the service. Now, both the IT admin and I hold our breaths and cross our fingers. The first user logs in, then the second, and so on! Cue epic symphonic music! The IT admin and I congratulate each other. If we had been in the same room, instead of working remotely, we might have hugged. It felt like we had just successfully disarmed a bomb! But in the end, what's the point? Why am I sharing this? Will another user out in there find this helpful? I don't know, you may never encounter this error. And I'm the first to hope you don't. But if this little tip resurrects just one users' Vault minutes before engineering completes their time traveling DeLorean. If one user is able to take this and say "I was able to minimize downtime...."
If one frazzled CAD manager is just a little less frazzled, then this post did it's job!